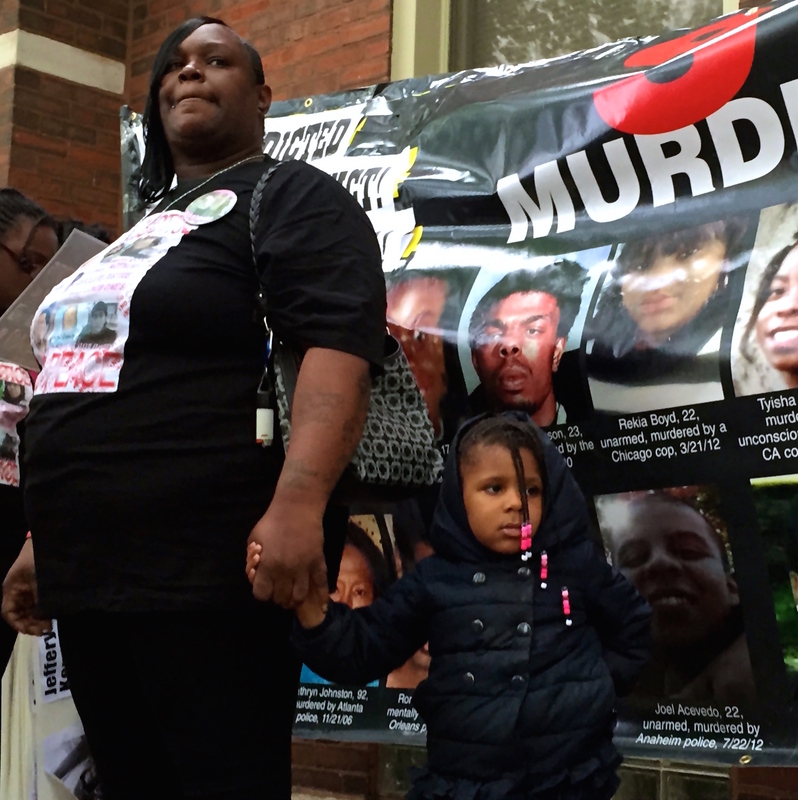 A group of mothers protested police violence Saturday evening on the South Side, near the spot where 15-year-old Dakota Bright was fatally shot by Chicago police in 2012. Police claim Bright was killed after he pointed a gun at an officer, but Edwards maintains her son was unarmed. Officers on-scene declined to comment for this story. The “Mother’s Day March Against the Police State” was the latest in a series of demonstrations aimed at law enforcement, targeting what organizers call systemic racism, violence and a culture of impunity within police departments nationwide. Demonstrators rallied steps from the alley where Bright was killed, then marched nearly a mile to the Grand Crossing District police station. Chants, songs and the sounds of car-horns honking in solidarity filled the air as police officers silently tailed the slow-moving peaceful march — without much interaction with protesters. The group held a candlelight vigil outside the police station and Edwards read a poem for her slain son. It’s been more than two years since his death and Edwards said she still hasn’t found justice through the criminal justice system. Demonstrators said they are fed up “living under police occupation,” and called for no-police zones in communities they say have been brutalized by “state sponsored black genocide” at the hands of Chicago police officers. “Strong communities make police obsolete,” organizers repeated during the rally. Demonstrator Daphne Jackson described a “war” being waged by police on black communities, and said it was time for people to stand up and defend themselves. “They’re not here to help us. We are our help,” she said. Jackson also pointed past the police, at larger public policies that systematically disenfranchise and subsequently criminalize black men in America. “This is what society gave them. Stop blaming them for it,” she said. Freddie McGee, whose 34-year-old son Freddie Latice Wilson was killed by Chicago police in 2007, said he sees trouble ahead if the criminal justice system doesn’t reform in a major way. “People are tired of marching peacefully,” he said.